The restaurant supply superstore carries a wide range of salad Croutons from Burry Foodservice and General Mills. Patrons love to munch on these crispy, tasty little gems on top of their salad. Burry Croutons Homestyle Seasonal 1 Lb. Burry Homestyle Seasonal Croutons 10 Lb. Burry Homestyle Seasoned Croutons 2.25 Lb. Burry Seasoned Croutons 10 Lb. Burry Croutons Plain Toasted 10 Lb. Burry Croutons Seasoned Portion Pack 0.25 Oz. Fresh Gourmet Italian Seasoned Croutions 0.5 Oz. 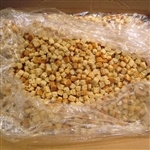 Fresh Gourmet Plain Crouton Cube - 10 Lb. Fresh Gourmet Homestyle Seasoned Croution 2.5 Lb. Fresh Gourmet Seasoned Crouton Cube 10 Lb. Fresh Gourmet Seasoned Croution Cube 0.25 Oz. Crouton Asiago Cheese Ciabatta - 2.5 Lb. Crouton Butter and Garlic Trans Fat Free - 2.5 Lb. Fresh Gourmet Homestyle Deli Style Garlic Crouton - 2.5 Lb. Crouton Fresh Garlic Trans Fat Free - 2.5 Lb. Crouton Homestyle Cheese and Garlic Multi-Grain Trans Fat Free - 2.5 Lb. Crouton Homestyle Cheese and Garlic Trans Fat Free - 2.5 Lb. Crouton Homestyle Plain Trans Fat Free - 2.5 Lb. Crouton Homestyle Seasoned Trans Fat Free - 2.5 Lb. Crouton Seasoned Cube Trans Fat Free - 2.5 Lb. Homestyle Crouton Cheese and Garlic - 1 Oz. Croutons Homestyle Caesar - 0.5 Oz. Homestyle Seasoned Croutons - 2.25 Lb. Rothbury Farms Classic Seasoned Croutons - 2.25 Lb. Rothbury Farms Homestyle Buttery Garlic Croutons - 2.25 Lb. Rothbury Farms Homestyle Cheese Garlic Croutons - 2.25 Lb. Homestyle Cheese Garlic Croutons - 2.25 Lb. Parmesan Cheese Crispy - 200 Gr. Cello Parmesan Whisps - 2.12 Oz. Parmesan Cheese Crisps - 200 Gr. Parmesan Crisps - 2.25 oz. Tomato Basil Parmesan Cheese Whisps - 2.12 Oz. Cello Single Serve Parmesan Whisps - 0.63 oz. Restaurant Salad Croutons are great for restaurants and salad bars to help their customers make the best salad ever.